The Zero Tolerance 0301ST by Kershaw is a tough knife, and it shows. 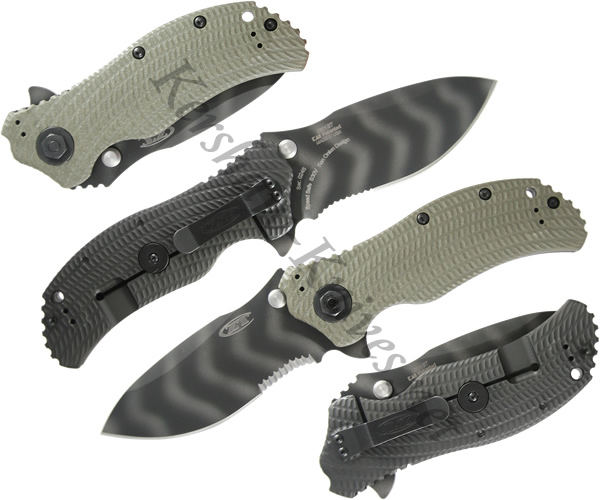 The partially serrated S30V stainless steel blade has been coated with Tungsten DLC in a tiger stripe pattern that stands up to the triple threat of dulling, wearing, and corroding. The handle has a Ranger green G-10 overlay that is deeply textured for ultra superior gripping. A generous finger guard and a thumb rest along the top of the handle allow you to choke up on the knife for added control. The Kershaw Zero Tolerance 0301ST has SpeedSafe opening technology. Enjoy single handed, ambidextrous opening via the dual thumb studs or the flipper. A removable, reversible carrying clip is included.